The EU has one of the largest deep-sea fishing fleets in the world. These fleets have moved into ever-deeper waters in the Northeast Atlantic as coastal and continental shelf fisheries became fully or over-exploited. In January 2017, a new EU regulation on deep-sea fishing came into force including a ban on bottom trawling below 800 meters in EU waters, and an obligation to close deep-sea areas to bottom fishing to protect vulnerable marine ecosystems. This page looks back on the long campaign for this regulation and highlights the work remaining to protect a uniquely valuable, and vulnerable, environment. Since 2004, the General Assembly of the United Nations (UNGA) has repeatedly called on countries to take urgent action to either regulate deep-sea fishing, in particular deep-sea bottom trawling, to protect vulnerable marine ecosystems, or to stop deep-sea fishing on the high seas. The previous regulation for the management of EU deep-sea fisheries in the Northeast Atlantic, adopted in 2002, left most deep-sea stocks outside safe biological limits and failed to protect vulnerable coral, sponge, and seamount ecosystems from adverse impacts of highly destructive bottom fishing. In July 2012, the European Commission issued a legislative proposal to overhaul the EU’s regulation of deep-sea fisheries including phasing out the use of bottom trawl and bottom gillnet fishing to target deep-sea species. A new regulation needed agreement by the European Parliament and Council of the EU’s 28 Fisheries Ministers. In December 2013, after continual delays and an aggressive campaign by a number of deep-sea trawling industry associations, the European Parliament voted to strengthen the text in many areas but the proposal to phase out deep-sea bottom trawling and bottom gillnetting was narrowly defeated by a vote of 342 to 326. However, 20 Members of the European Parliament (MEPs) later formally corrected their vote and although such corrections do not change the text adopted, it is clear that a majority of those who voted were also in favour of eliminating these destructive deep-sea fishing practices. With the ball back in the court of the Council, delays continued until, after intensive campaigning, ministers adopted a position in November 2015 with a ban of bottom trawling below 800 meters, a compromise between those rejecting any limit and scientific evidence supporting a shallower 600 meter limit. A political agreement along these lines was finally reached by negotiators from Council and Parliament at the end of June 2016, subsequently endorsed by the Council of Ministers, and in December 2016 approved by the vote of the Parliament. The priority now is to ensure vigorous and effective implementation. Observer coverage on at least 20% of vessels using bottom trawls or bottom-set gillnets to target deep-sea species, and on at least 10% of all other vessels authorized to catch deep-sea species. The regulation applies to all fishing in EU waters of the Northeast Atlantic, approximately 932,000 km2 of which lie below 800 meters – an area larger than the size of Spain and Germany combined. Approximately 143,000 km2 of this area consisting of the continental slope and adjacent seamounts, are between 800 and 1,500 meters deep, the maximum depth that bottom trawling generally occurs in this region. These areas, which has a high diversity of fish species and is rich in deep-water bottom habitat-forming species, will now be protected from bottom trawling. In the international waters of the central east Atlantic off West Africa, EU vessels will be prohibited from bottom trawling on approximately 70 of the 100 seamounts that have peaks shallower than 1,500 meters deep. Appropriate mechanisms are in place for monitoring, control and surveillance to ensure compliance with the deep-sea trawl ban and the area closures to protect VMEs, and annual reports from member states are requested and submitted. 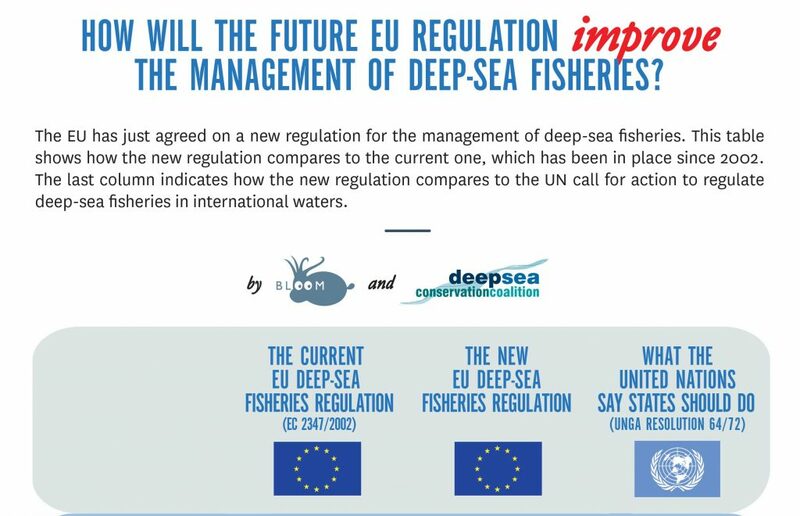 To complement the new regulation, the EU should continue working with other countries to enhance the protection of deep-sea ecosystems in international waters where the Spanish and other deep-sea trawl fleets fish. The EU should ensure sustainable fisheries through effective limits on the catch and by-catch of deep sea species. Deep-sea species are generally slow-growing, late-maturing and have a low reproductive rate, which makes them particularly vulnerable to overfishing. However, with the adoption of the reformed Common Fisheries Policy (CFP), ministers insisted that specific measures on fishing limits and bycatch prevention were not necessary in the new deep-sea regulation. Every two years the Council sets the total allowable catch (TAC) for deep-sea species for EU fleets and in November 2016 adopted catch limits for deep-sea species for 2017 and 2018. We had high hopes that the ministers would complement their agreement for the protection of deep-sea habitats with sustainable fishing limits for deep-sea species in line with the CFP and commitments made at the UNGA. However, while TACs for many deep-sea stocks were reduced, most remain above the levels recommended by the scientific community. Ministers also allowed continued fishing of roundnose grenadier, which has been classified as endangered by the International Union for Conservation of Nature (IUCN), and introduced TACs for deep-sea sharks caught as bycatch, several of which are listed as endangered or critically endangered, reversing the zero quotas for deep-sea sharks that have been in place for the past several years. The EU will once again set catch limits for deep sea species in EU water in November 2018. We hope to see significant improvements in the limits imposed for deep sea fisheries.